Adis says:Welcome again to Quicksketch Sunday! 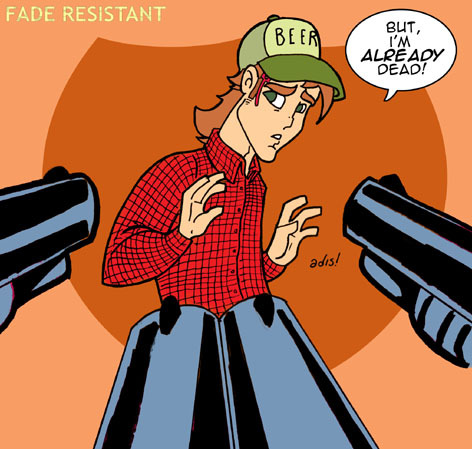 Today we're looking at Fade Resistant by Max Kimbrough. It's about an undead redneck on a mission to save the world (more or less). Anyway, I enjoyed doing artwork for it, and here's Max himself to tell us more about it. Suppose I'm a zombie, how would you introduce your comic to me? Well, first I think I'd have to point out that I have possibly the only comic out there where the main character is an undead zombie. You don't see that very often, and I guess I'd have to hope that you, as a zombie, would enjoy my positive portrayal of other zombies... and wouldn't eat my brains. I got the idea for having the characters be dead originally because that's a subject that interests me. As for the characters coming back to life as zombies, I was thinking one day about loopholes politicians put in bills and whatnot, and thought, "Wait a minute, what if there was a loophole in the afterlife that let people come back to life!?" The next logical step was to make them come back to life as zombies (hey, there's gotta be a downside to every supposedly good thing!). I always enjoy original takes on the afterlife, is it something you've always been interested in? ...Just kidding. Driving Miss Daisy is my favorite HORROR movie. My favorite action movie is The Indiana Jones trilogy (I love them all equally). Bits and pieces of myself are translated into my characters, but there's no one who is directly based off of me or anyone I know. I'm too boring in real life; in my comic, I can make my characters do whatever crazy stuff I want! What bands would the Fade Resistant soundtrack include? I'm not sure if there are any bands that could be suitable for the comic in general, but I can imagine different bands epitomizing the different main characters in my strip: Lynard Skynard for Jethro, Carlos Santana for Julio, Run DMC for Jamaal, Tim McGraw for Surly Joe, and The Lion King soundtrack for Eno. Aside from Tyra, I think it'd be awesome if Bill Watterson read my comic. I've got so much respect for Calvin and Hobbes that I think I'd hyperventilate if I found out Watterson liked my comic. What possesed you to start your own webcomic? Why, for the fame, fortune, and women of course. Actually, I've always been into drawing and I've been doing comics for friends and family since about '92. In high school, I took a lot of art classes, but when I went to college, I wasn't able to take any, so I decided to start a webcomic so I'd have SOME kind of creative outlet to keep me sane. What can we expect in the future from Fade Resistant? More epic storylines! Bigger explosions! Plot twists and back stabbing left and right! I plan on making All My Children seem tame in comparison! Would you believe that, as cuddly as my strip and my interests are, I enjoy your comic a lot. Do you enjoy mine? Of course! BOTH of your strips are great! If I didn't like them, would I have drawn you fanart?Adis' note: You'll see Max's fanart soon. Be patient. Thanks to Max for his cooperation, it was a lot of fun, devoting this week to his strip. Go check Fade Resistant and I'll see you tomorrow.